Summer 2018: Outstanding results placing the school in the top 6% of schools nationally. 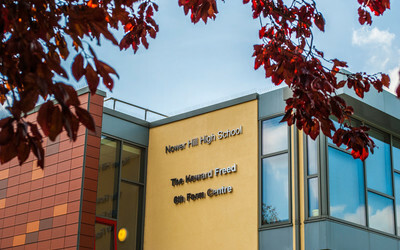 Nower Hill 6th Form is very popular with both Nower Hill students and those new to the 6th Form. The students value the outstanding advice and guidance given to ensure an effective transition both into 6th Form and onto Higher Education and we are very proud of our track record with exam success. Our dedicated, inspiring and supportive teachers are committed to enabling all students to achieve their full potential and this has led to our 6th Form being heavily oversubscribed. We welcome applications from students from all schools. There is a bursary available to all 6th Form students who meet the financial eligibility criteria. It is important to note that for the majority of students, they must have been in receipt of free school meals by 31st August of Year 11 to qualify. Nower Hill 6th Form is very high-achieving and we aspire to provide a world class education to our students. The key to our success in terms of academic achievement is having high standards and teachers that dedicate themselves to ensuring students achieve their goals. The students in the 6th Form are not only courteous, polite and well-mannered, but also extremely ambitious and we are keen to develop them to become the leaders of the future. We are very proud of the 6th Form and the opportunities offered to students; I would like to refer you to the Enrichment Opportunities listed below. If you are interested in becoming involved in any of these opportunities while at Nower Hill 6th Form, please place a tick next to the relevant opportunities on the online 6th Form Application Form. At Nower Hill we specialise in delivering A-levels and offer 30 different A-level subjects catering for the full range of interests and academic demands. The vast range of subjects on offer on site at Nower Hill is one of the reasons why we are so popular not only for our own students but for students from other schools. Ofsted rated the 6th Form as outstanding and stated: The curriculum provides an “extensive range” of 6th Form courses. We are part of the Harrow 6th Form Collegiate, which means that if you want to do one of the few courses we don’t offer, you could study one subject as an away subject at another school within the Collegiate. We have a large team of talented people dedicated to working exclusively in the 6th Form. The support students receive is excellent and we pride ourselves on looking after our students. Each member of the team has a huge range of experience to pass on to the students and this means there is a lot of expert support available. The 6th Form Heads of Year know the issues and common pitfalls that surround 6th form study and the transition from GCSE to A-Level. They also know every one of their students and acquaint themselves with any circumstances relating to students in the 6th Form that might need special consideration. Mrs Murray is our 6th Form Careers Advisor and Mr Mathias and Ms Giles are our Study Supervisors. Both are available to 6th Form students every morning and are able to provide mentoring throughout each day by organising 1:1 sessions during study periods to support those who most need/want our help to achieve their very best possible results. They assist students with managing their time effectively during silent study and organizing themselves well. In addition to this, each student is part of a form group containing a mixture of Year 12 and 13 students; we find the wisdom and experience passed on by Year 13 students to the Year 12s in form time enhances the students’ experience of form time each morning. Please take time to read what our students have said about Nower Hill in the prospectus – the most recurrent theme was the outstanding support given by teachers and how much they enjoy being part of the 6th Form here.